French voters will pick a new president on Sunday, choosing between young centrist Emmanuel Macron and far-right leader Marine Le Pen in a watershed election for the country and Europe. Le Pen, 48, has portrayed the ballot as a contest between the “globalists” represented by her rival—those in favour of open trade, immigration and shared sovereignty—versus the “nationalists” who defend strong borders and national identities. Voting will begin on the mainland at 0600 GMT in 66,546 polling stations. Most will close at 1700 GMT, except those in big cities which will stay open an hour longer. A first estimate of the results will be published around 1800 GMT. 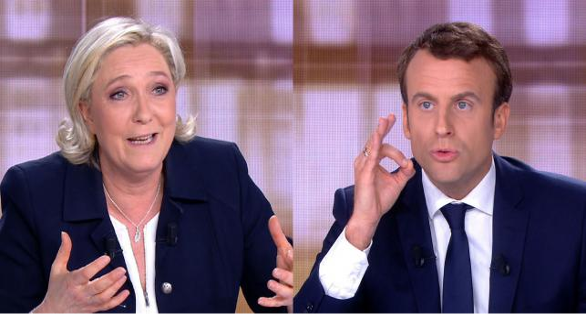 “The political choice the French people are going to make is clear,” Le Pen said in her opening remarks during an often vicious debate between the pair on Wednesday night. The last polling showed Macron—winner of last month’s election first round—with a widening lead of around 62 percent to 38 percent before the hacking revelations on Friday evening. A campaigning blackout entered into force shortly after. France’s election authority said publishing the documents could be a criminal offence, a warning heeded by traditional media organisations but flouted by Macron’s opponents and far-right activists online. “We knew that there were these risks during the presidential campaign because it happened elsewhere. Nothing will go without a response,” French President Francois Hollande told AFP on Saturday. US intelligence agencies believe state-backed Russian operatives were behind a massive hacking attack on Democratic candidate Hillary Clinton’s campaign ahead of America’s presidential election last November. There has been no claim of responsibility for the French hack, but the government and Macron’s team previously accused the Kremlin of trying to meddle in the election—accusations denied in Moscow. Whoever wins Sunday’s vote it is set to cause profound change for France, the world’s sixth-biggest economy, a permanent member of the UN security council and a global military power. It is the first time neither of the country’s traditional parties has a candidate in the final round of the presidential election under the modern French republic, founded in 1958. Macron would be France’s youngest-ever leader and was a virtual unknown three years ago when he was named economy minister, the launching pad for his sensational presidential bid. He left Hollande’s Socialist government in August and formed En Marche, a political movement he says in neither of the left or the right and which has attracted 250,000 members. The ex-investment banker’s programme pledges to cut state spending, ease labour laws, boost education in deprived areas and extend new protections to the self-employed. He is also fervently pro-European and wants to re-energise the 28-member European Union, following Britain’s referendum vote last summer to leave. “France is not a closed country. We are in Europe and in the world,” Macron said during Wednesday’s debate. But Le Pen is hoping to spring a shock that would resonate as widely as Britain’s decision to withdraw from the EU or the unexpected triumph of US President Donald Trump. Macron topped the first round of the presidential election on 23 April with 24.01 percent, followed by Le Pen on 21.30 percent, in a crowded field of 11 candidates.